Sri Lanka e-Visa or ETA for Indians - Be On The Road | Live your Travel Dream! There was a time when we Indians used to enjoy free visa on arrival when visiting Sri Lanka. These days, we need to get a visa in advance before we go on that Sri Lanka holiday. Thankfully, Sri Lanka offers an e-visa facility, one that they call Electronic Travel Authorization or ETA. We Indians need to get this ETA before we board our Sri Lanka bound flight out of India. Here’s the low-down on how to get this Sri Lanka e-visa or ETA. 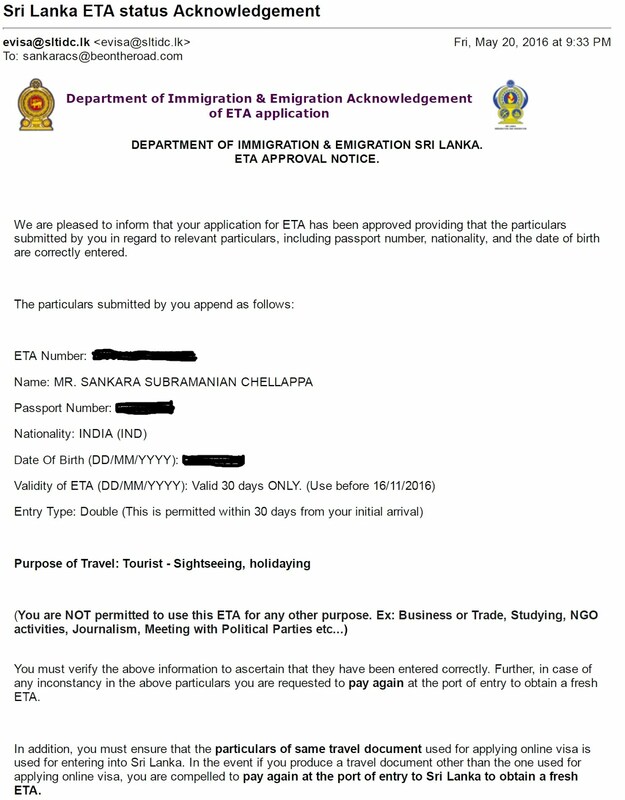 This is how I got my Sri Lanka ETA (e-visa) for my upcoming trip. 2) Click on the Apply Button. It opens up a new page that contains an online form. You can also read about the different types of visa and fees here. 3) Choose the type of ETA (tourist, business or transit) that you wish to apply for. 4) Fill in your personal particulars, passport details, flight details and address in Sri Lanka. 5) Pay a fee of USD 20 (for a tourist visa) using your credit card after you review the completed form. 7) And within 24 hours, you will receive an approved ETA number in your inbox. I received my approval in like 7 minutes from the actual process completion. It was lightning fast in addition to being super simple. Visa Extendable? : Yes, once from within Sri Lanka. To enjoy your Sri Lanka holiday, all you need to show to the immigration officers is your passport, your ETA, your return flight ticket and enough money to substantiate your financial security.